Cultivated plot, near Jos, Nigeria. Photograph by Edwin R. and Emily Dean, 1966. The Earth Matters exhibition features, for the first time, three earth works installed in the Smithsonian Gardens (SG) on the National Mall. This monumental undertaking was detailed in an earlier post by SG supervisory horticulturist Jonathan Kavalier, but the works began in conception long before they ever materialized in physical form. The artists, Ghada Amer of Egypt, Strijdom van der Merwe of South Africa, and El Anatsui of Ghana and Nigeria (and Ledelle Moe, whose outdoor sculpture has also been installed outside of the National Museum of African Art), each came to visit walked the gardens before they even began the process of creating, getting a feel for the unique spaces of the garden and beginning the thought process about what shape and material form their earth works would take. El Anatsui, for instance, looked to challenge conceptions of what an earth work might be made of in his work, Ala, named for the Igbo earth goddess. The pyramid of mirrors and rusted metal that ultimately emerged seems deceptively industrial when first viewed. But Anatsui says that he “settled for something that just rests [on the ground], something which is light but has allusions to the earth—because the material I am going to work with is rusted metals. Metal is from the earth, as are the reflective sheets. Glass is silica, which is soil, so I am still using the earth. …” (personal communication with curator Dr. Karen E. Milbourne, Sept. 10, 2012). But for Anatsui, in this and past works, each metal sheet references a very specific usage of earth. In a standing arrangement with manufacturers from his home base in Nsukka, Nigeria, Anatsui asks that used cassava graters be given to him. He leaves them in his studio yard for months or years so that they rust and take on different patinas. Made from discarded galvanized iron oil drums and punctured with nails to create a surface upon which tough cassava root can be grated, these graters signal, for Anatsui, the intersection between nature and human intervention in the form of agriculture and food cultivation. Anatsui’s earth work shows us the common ground shared by nature and industry. Cassava (Manihot esculenta) is a staple crop in western Africa, particularly in Nigeria where Anatsui continues to live and work today. High in carbohydrates, this common plant is cultivated throughout the world in sub-tropical or tropical climates due to its high resistance to drought. 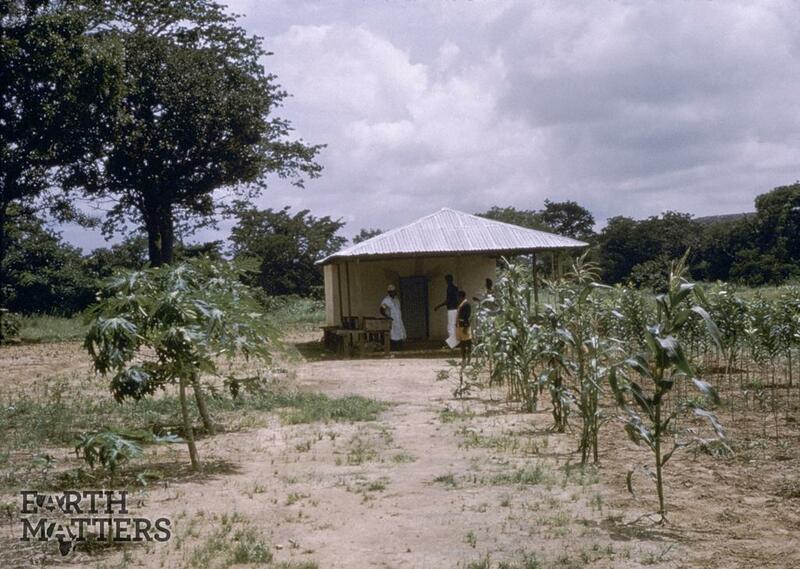 In this photo from 1966 by Edwin R. and Emily Dean, taken in Nigeria, a cultivated plot of cassava can be seen in neat tidy rows. Here, we can see the crop as it looks when growing, although the true value of cassava is not in view – the tough roots are where the nutritional value is, necessitating the use of the tough galvanized-iron-and-metal graters that Anatsui utilizes. Today, Nigeria is the world’s largest producer of cassava, and farms tend to look different today than they do in this photo from over forty years ago. Though the neat rows remain, farms tend to be much larger and the crop is useful in that it can serve as a cash crop during good harvests, but can also feed its producers as a hardy, nutrient-rich subsistence crop during leaner times. Where does agriculture fit into your conception of the earth? Do you consider it “natural,” or does your definition of earth differ? This entry was tagged Cassava, El Anatsui, Ghada Amer, Ledelle Moe, National Mall, National Museum of African Art, Nigeria, Smithsonian Gardens, Strijdom van der Merwe. Bookmark the permalink.